This church is an extraordinary success story, but it nearly didn't turn out like that. 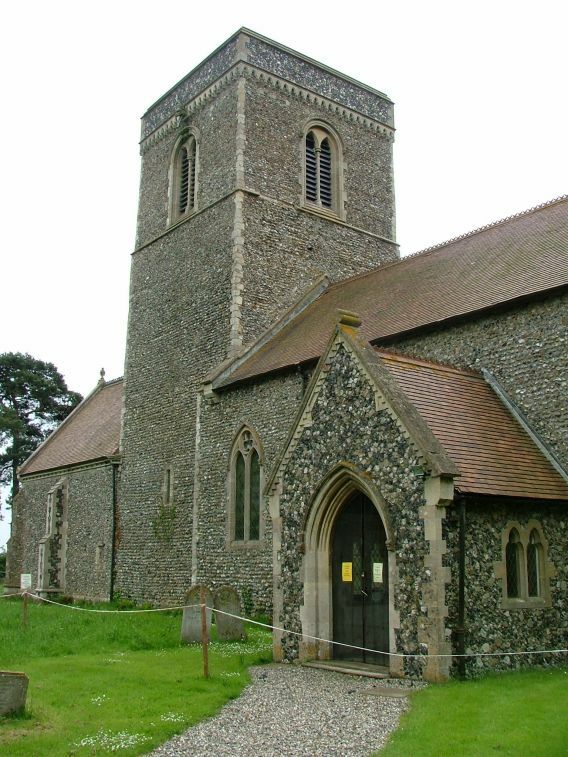 My friend Peter Stephens has always been very fond of St Nicholas, and urged me to come and see it when I started to seriously explore Norfolk's churches. He'd always found it open, he said. But my first visit to this church was ill-fated. It was early 2006, and I got here to find that not only was it locked, but the church had been closed some six months earlier, and was no longer in use. It seemed that movement had been observed in the central tower, and that urgent repairs were required. A cordon surrounded it to stop anyone being near when it finally collapsed. 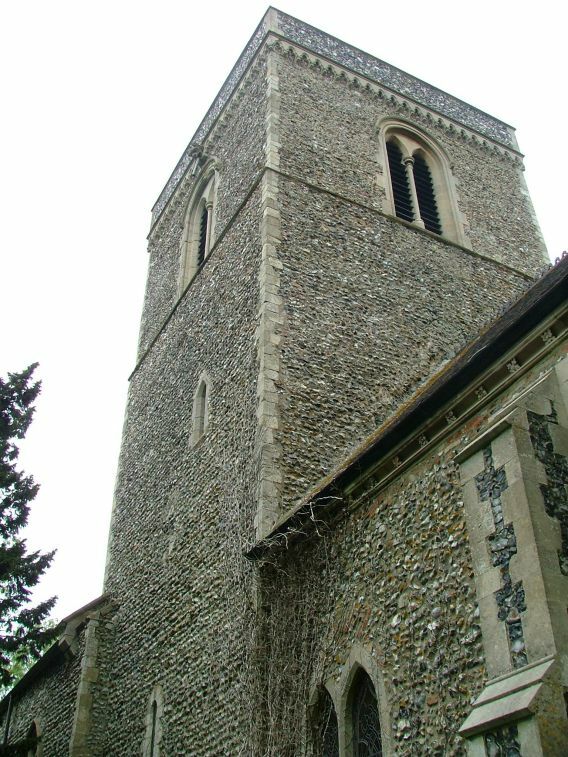 That St Nicholas is Norman in origin is clear, both from the lower part of the tower and the impressive south doorway. 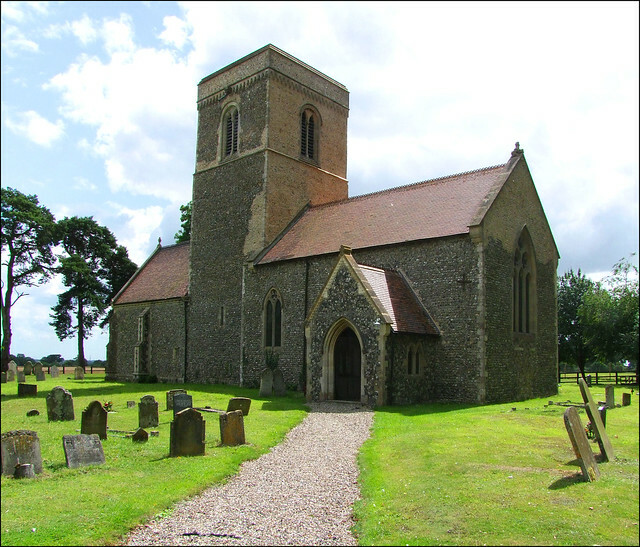 The rest of the church was elaborated in the 13th century, but there was a fairly massive restoration in about 1870 by that uninspiring but safe pair of hands, diocesan architect Richard Phipson. He had a great eye for detail, and so almost all is actually Victorian, including the discreet north porch. Looking at it in 2006, I thought it was lovely, in its quiet churchyarrd surrounded by open fields, some distance from the nearest other building. Thin trees stood sentinel. I wondered what would become of it. A sign on the gate said that a meeting was to be held, and it invited all parishioners. The problem was, simply, that the repairs would cost an astronomical figure, way beyond anything that the local band of CofE members could possibly find or ever repay. The suggestion was that a new use for the building might be found, but what on earth could be done with this place, handsome as it is, when it was so far off the beaten track? My personal feeling as expressed at the time was that churches like this were worth keeping simply for their own sake, as artistic creations and historical artifacts. Most of us these days are not Anglicans, and will never find ourselves in a Church of England parish church on a Sunday morning; but still these medieval buildings remain, and they really should be well worth keeping as the heart of our communities. So what was to be done without us all embracing the lukewarm protestantism of most English village churches? Well, the people of Fundenhall rose to the occasion. Fetes and barn dances were held, sponsored walks and jumble sales. Local businesses made their contributions, as did several large corporate organisations. People who had never attended a service at St Nicholas soon developed a sense of ownership for this beautiful old building in their midst. Carol services were held in 2008 and 2009, which must have been haunting occasions, and when the repairs were all complete the Bishop of Norwich rolled up on 23rd May 2010 to reopen and rededicate the place. And, best of all, both the interior and exterior of the church are looking better than they have for a hundred years. Coming back in 2010, it was with some excitement that I pushed open the north doorway and stepped inside. The interior is entirely of its 19th Century restoration, but still has a great sense of that time - or, more exactly, of the early 20th Century, when the Church of England was at its zenith. The view east from the font is of minton tiles and darkly coloured pitch pine furnishings towards the western tower arch of the central tower: beyond, through the gloom, the east window infuses the chancel with light. Cutting across the vista is Norfolk's best-preserved roodloft coving - it is easy to imagine the loft above. The screen itself has gone, and the coving appears to float in the air. Perhaps because this building was so nearly lost to us, the memorial inscriptions are particularly moving. The vine-patterned glass in the chancel remembers Mary Elizabeth Barton, born 20 July 1859, died 6 November 1865. Her father was Gerard Barton, of Fundenhall Grange. His memorial nearby tells an interesting story: As a layman, in the absence of a resident minister, he was a father to the people, restored this church and for 14 years was a bright example of truth to all around. In 1874 he took Holy Orders, and when Chaplain at Freiburg in Barden was stricken with the illness which enabled him for the last ten years of his life to glorify God by the marvellous patience and resignation with which he bore his sufferings. In the nave, two brass plaques remember the Browne brothers, both killed in France in the First World War, one in 1916 and the other in 1917. Another brass plaque remembers Walter Rattee, a 22 year old sergeant killed at High Wood in the battle of the Somme. They are on the war memorial along with ten other Fundenhall boys, and the roll of honour also survives to remember all those who went to fight. Nearby, a marble tablet remembers another Fundenhall resident who died far from home, Harriett Howes who died suddenly at Ischl, Upper Austria in 1877. Take no thought of the morrow, it implores us. All graveyards are satisfying places to wander, and Fundenhall moreso than most. A Rattee headstone of an earlier generation remembers Daniel Herbert Rattee, the beloved son of James and Emma Ratteee, who died at the age of 17 in 1876. Another child's headstone is to Little Bennie, the beloved child of John and Harriett Feltham, who died at the age of two years and ten months a few weeks before the outbreak of the First World War. He was a flower too tender, too sweet to rear, begins the inscription, noting at the end that the headstone was erected by his Uncle Jack. 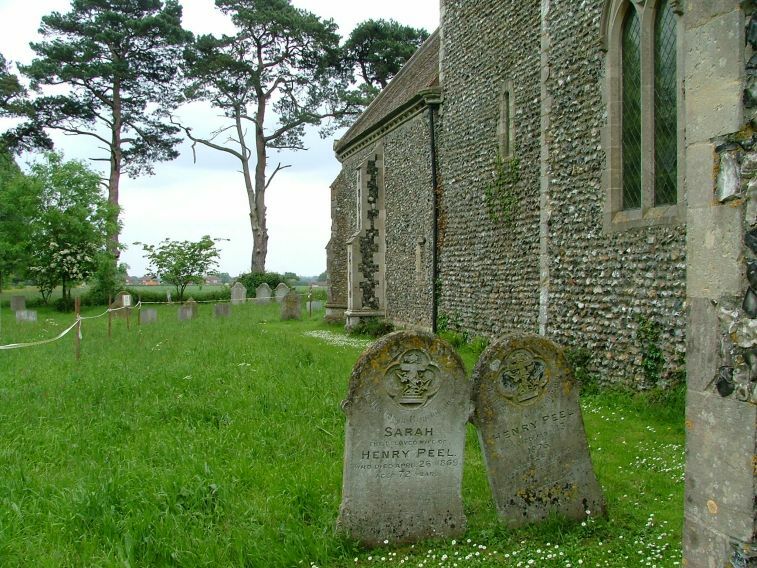 Perhaps the most famous Fundenhall memorial of all is the pair of headstones to Sarah and Henry Peel, who lean on each other in death as they must once have done in life. Nearby, a severe early 19th Century inscription advises us sternly to Learn to Die.